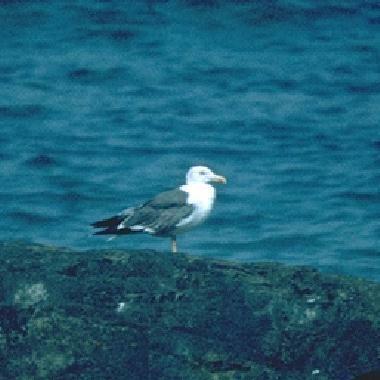 Similar to those in Tanger with short legs (70% of body-height above), darkish blue-grey mantle and quite white head. This one is moulting P7/P8. P9 is shorter than P10, the head is rounded and the chest is bold. Very pale head, breast and belly with darkness just around the eye. The legs are still a flesh colour and the bill is all black. The mantle is fairly uniform with grey on scapulars. 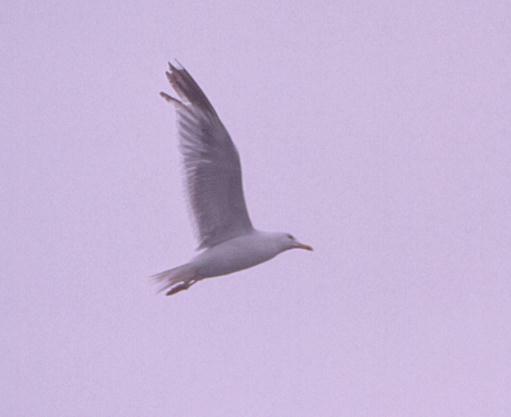 The tertials are 3rd generation with much white. Moult is nearing completion but P10 is still to grow fully. The legs are longer than those in atlantis but shorter than those in michahellis at about 80% of body height above. 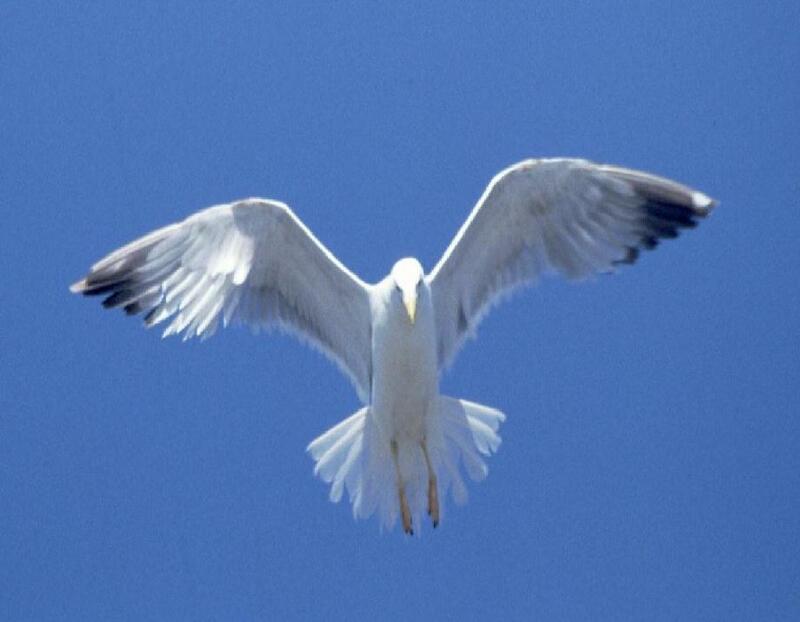 Bird above. Obvious pale primary panel, very white on rump and base of tail, only one inner-wing bar (secondary), P10 missing, tail still in moult. Quite an attenuated appearance. The head is fairly boxy and the legs are short. The mantle shade is grey-brown with a ruddy tinge. The tertials show a broader white fringe than graellsii and the border is slightly notched. The head, in bright sunlight, is still quite dusky. Short legs and a squarish head. The tertials have a narrow white terminal fringe as in graellsii. P10 is long, projecting beyond P9. The head is very pale. 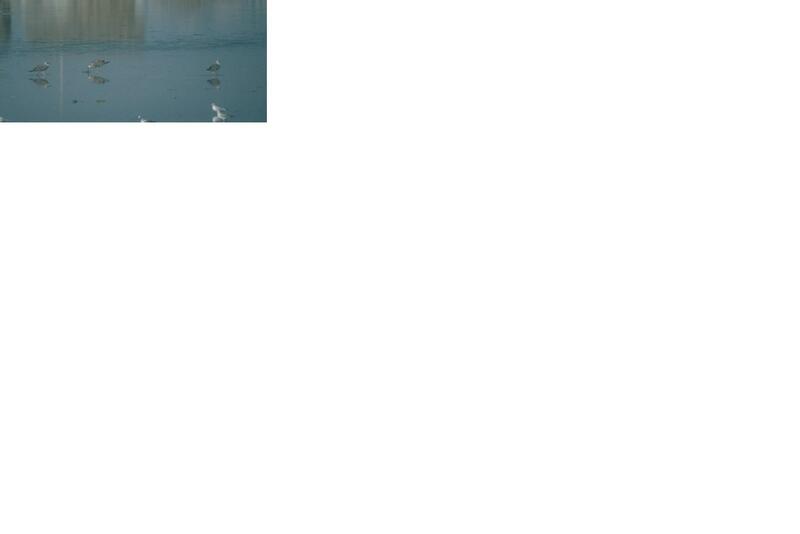 Bird on left is the dusky-headed one above. 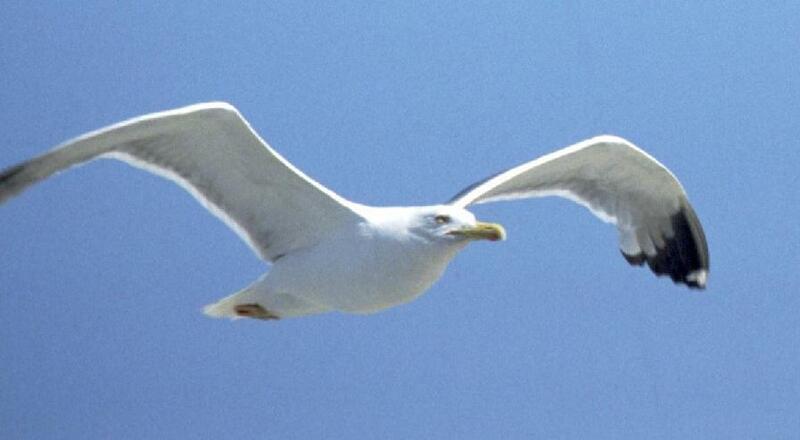 The one on the right is a pale-headed heavily-structured bird with short legs. The small bird is interesting. 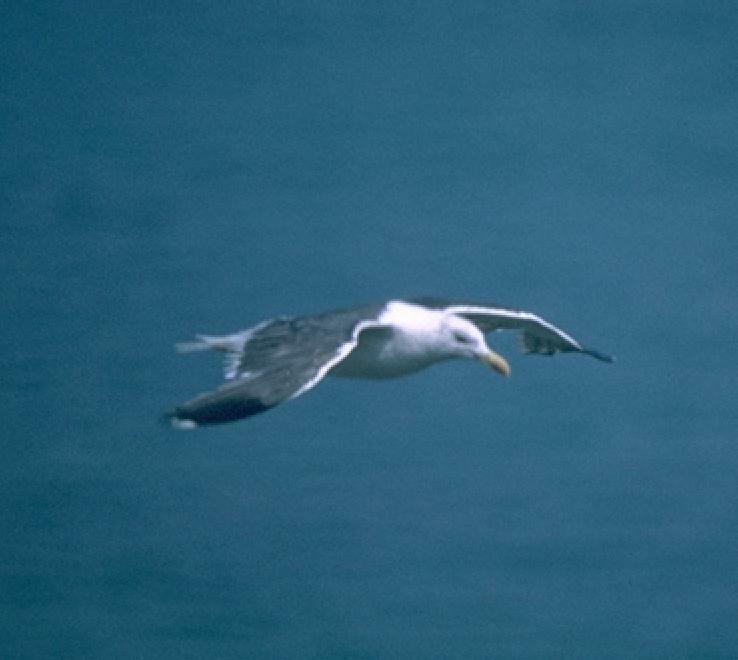 It is fine and small in all respects and could be an atlantis but the tertials show a broad white fringe and tip which is rarely found in atlantis. It is probably just a small individual of the local type. Comments: from the two sets of observations above, similar conclusions can be reached. Those at Gibraltar/La Linea show atlantis features in their short legs, the frequent bunching of the primary tips P8-P10 on the closed wing and a darkish blue-grey mantle shade. However their heads are heavier and more squarish in shape (20% are boxy), some birds show a greater projection of P10 outside P9 and the overall appearance is more robust as in michahellis. 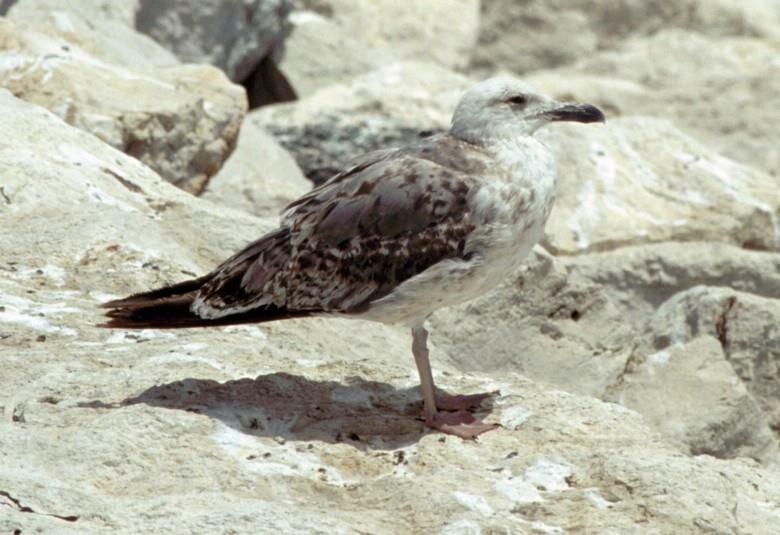 The calls are close to those of the forms found on the Atlantic coast of Morocco from Agadir-Tanger, that is shrill graellsii-like long calls and graellsii-like mews. 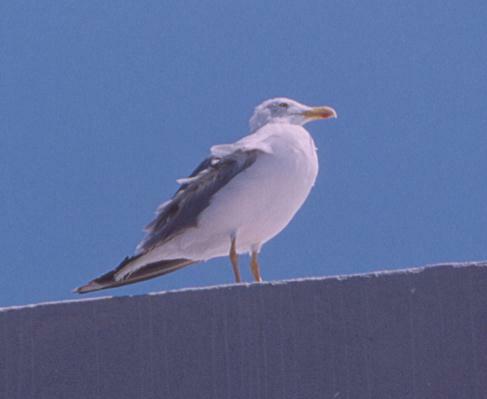 The tertials in the juveniles are variable suggesting a mixing of forms: 55% are like those in the Canaries with a narrow pale fringe; 20% show notches on the sides of the feathers, 20% show a broad pale tip and 5% internal markings. 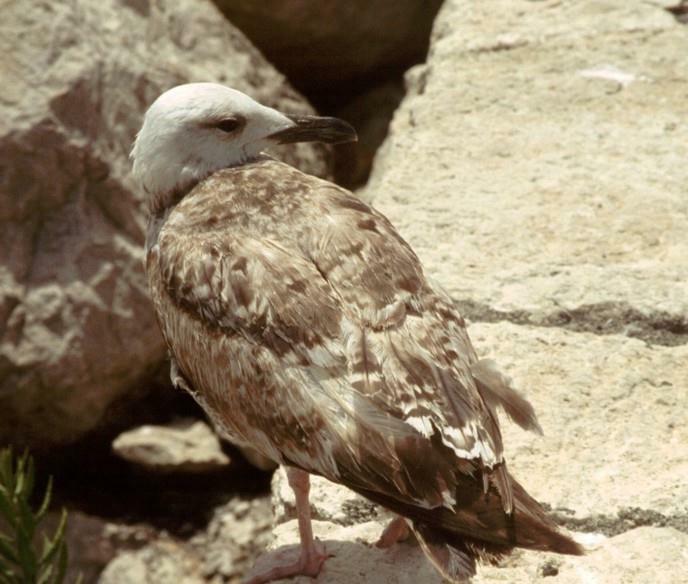 The juveniles also have a tendency to be paler: as many as 25% show a white head and only 35-40% show heavy streaking on the belly and breast. 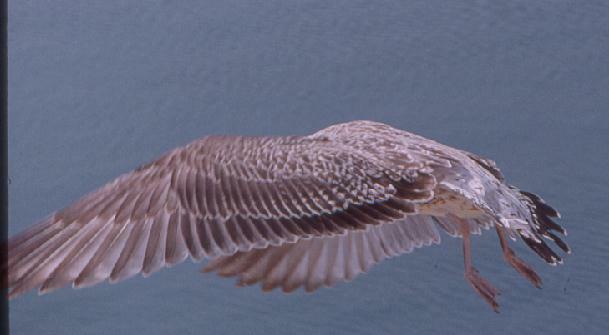 All juveniles show only one bar on the inner wing. 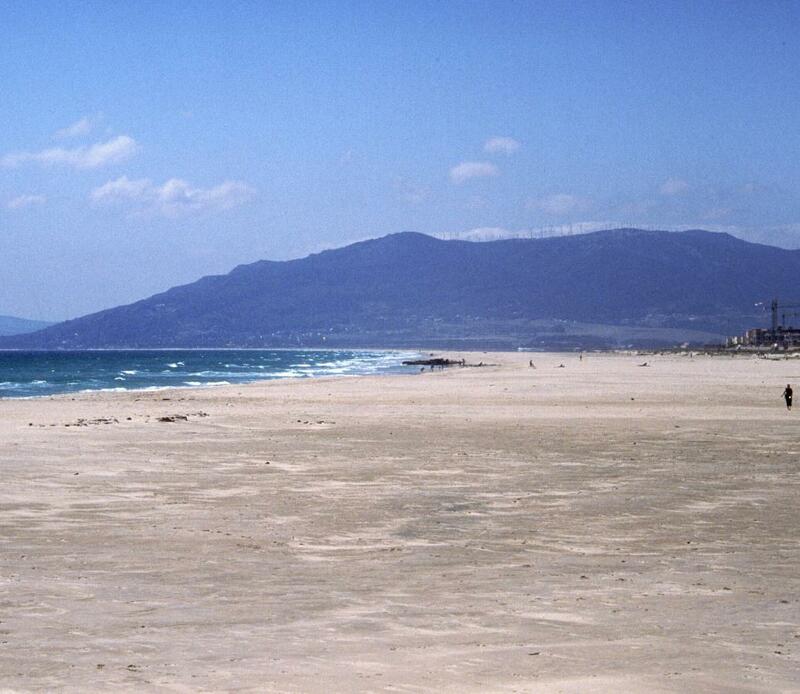 Photographs taken from 15-24 August 2001 and on 3 June 2002 by Nick Rossiter. 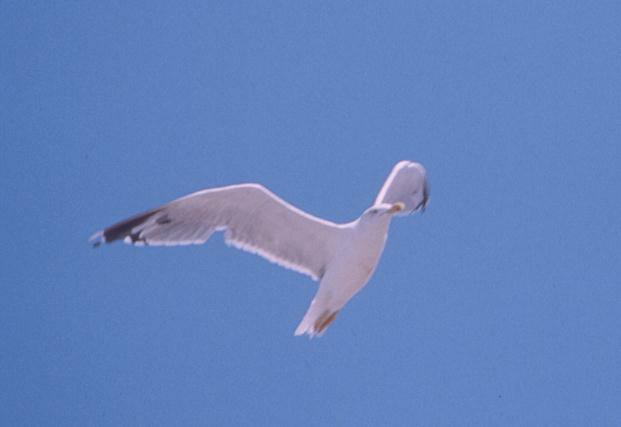 quite long legs (c80% height of body above) with rich ochre hue, typical bill shape with steep culmen, distinct speckling above and behind eye, mantle a darkish blue-grey, head not boxy but with a flattish area on crown; in flight this bird showed a white tip to P10 and no mirror on P9, P8-P10 are old and can be seen as bunched tips on the folded wing, P7 is missing, P6 growing and P1-P5 new with P5 showing a broad dark band. moulting P5/P6, new P1-P4, old P7-P10, large white tip P10, no mirror P9. 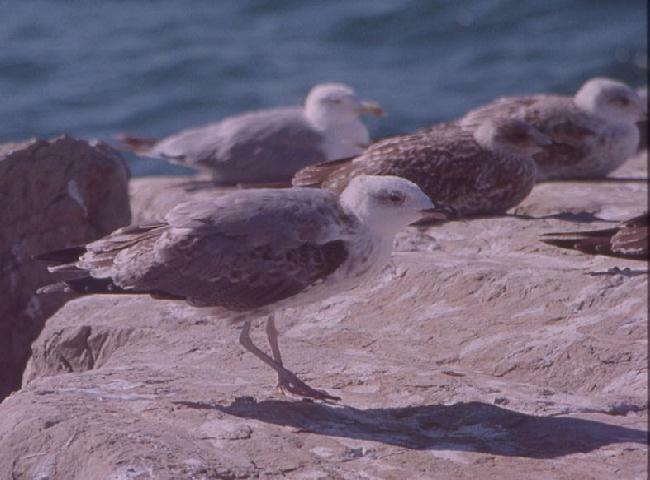 from left juvenile YLG, adult YLG, adult LBBG (probably graellsii), juvenile YLG. Note smallness of LBBG to these YLG and the LBBG's slighter head, bill and breast. Both YLG juveniles have considerable streaking on breast and belly and moderately dusky heads. 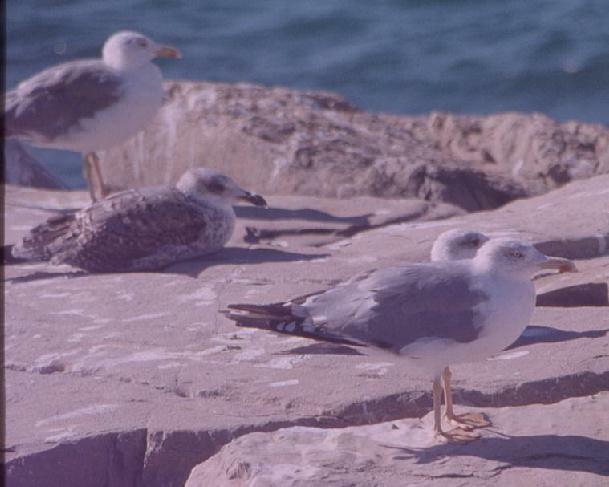 The legs of all three YLG are short, like those of the LBBG. Small mirror on P10, mirror on P9, black triangle on wingtip slightly indented, broad mark P6, P1-P3 new, missing P4-P5, old P6-P10, moult is relatively advanced. Very pale eye and heavy, stubby yellow bill. Dark blue-grey mantle, primary tips bunched with P9 over P10, P8 close by and P5-P8 evenly spaced. 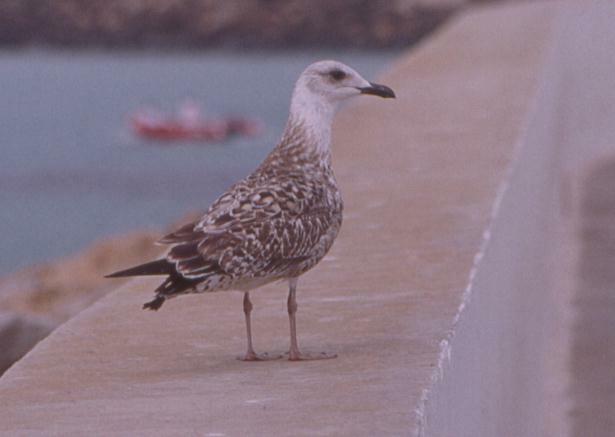 Very short ochre legs, c0.62 of body above and fairly round head; bold chest. Dark blue-grey mantle, less bunched tips with P8 more inside P9/P10; deep ochre legs. indistinct mirror on P10, none on P9, old P8-P10, P6-P7 missing, new inner primaries, P5 with extensive dark smudge near tip, P4 thin band, P1-3 not marked, head is dusky and hindneck is spotted, hint of residual dark marking on outer tail feather. Moult P1, largish mirror P10, none P9, slight indent to black triangle, large black bar on P5, thin black line on P4, dusky marks on underside of primaries and in carpal area indicate immaturity. Legs are ochre, bill a bright yellow. Eating a fish scrap, bright yellow bill, ochre legs, conspicuous underwing coverts and outer primaries, most of tail band retained, P1/P2 new, P3/P4 missing, P5-P10 old; white underbody and head. New P1, missing P2/P3, old P4-P10; underwing coverts more faded, bright yellow bill with orange-reddish gonydeal spot, ochre legs, few specks on belly, head and breast white. 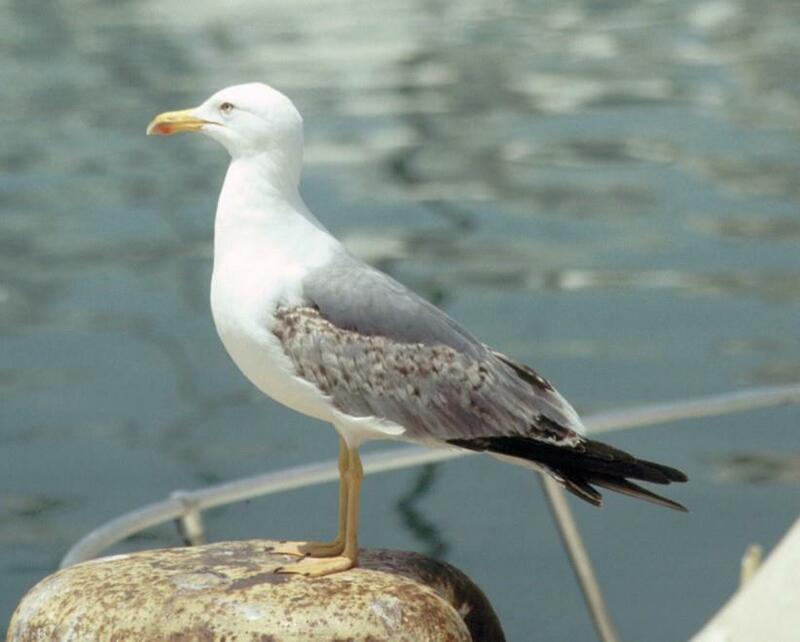 Bright blue-grey back and scapulars, much mottling retained on coverts, rounded head, short legs, very pale eye, bright yellow bill, white underbody and head, fleshy-yellow tinge to feet. a much duskier immature than that below with a dusky head all over and particularly heavily marked eye spot; heavy streaking on breast, contrasting underwing coverts, pointed primaries, outer primaries moulted and re-growing, heavy cylindrical bill with steep culmen angle. P1-P4 new, missing P5-P6, old P7-P10. Fairly obvious underwing coverts, heavy moult on tail, bill showing more diffuse black; legs are very pale with fleshy feet, sparse mottling on belly and head even in very strong sunlight. Smallish round head, heavy bill with diffuse black, some spotting and slight streaking retained on head, belly also with sparse markings, grey emerging on back, coverts still very mottled. 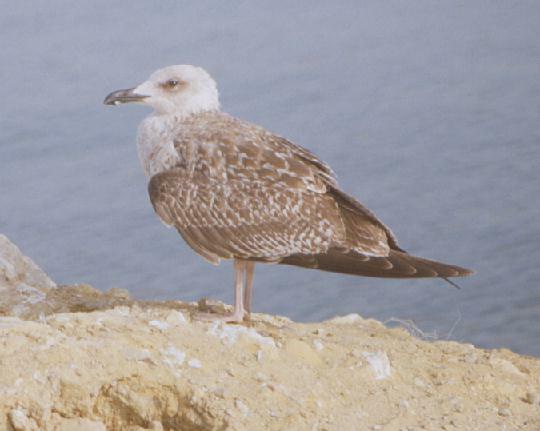 a marked reddish tinge to mantle, tertials showing quite a broad white fringe and larger white tip than normal for atlantis, legs around 80% of body height above legs, head and neck relatively pale except for dark eye spot, heavy all-black bill, quite a scaley mantle in texture. 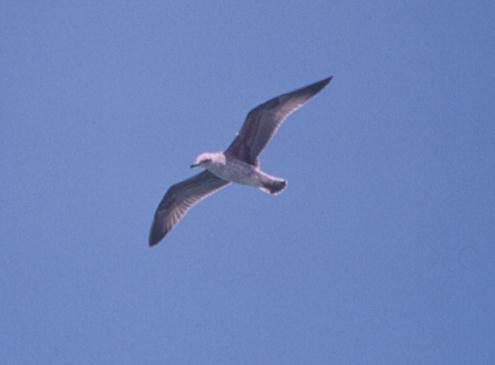 same bird in flight, white upper tail except for a few dark spots, flesh legs, obvious secondary bar and moderately strong greater coverts bar, no pale primary panel on inner primaries, marked contrast of underwing coverts with rest of underwing. Comments: close to atlantis in mantle shade and colour and to those at Estepona in wingtip pattern with 33% of adults showing a mirror on P9. 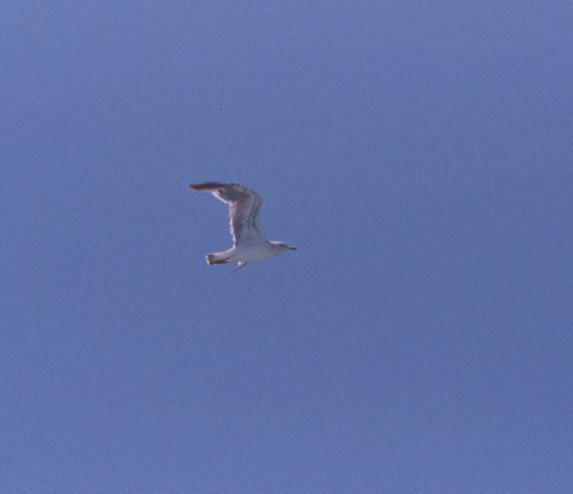 In size larger than atlantis, being significantly bigger than Lesser Black-backed Gull but obviously smaller than michahellis. Structurally the legs are short but some tend to be longer (around 80% of body height above legs) than those of the Dark form (70%). The heads tend to be rounded. 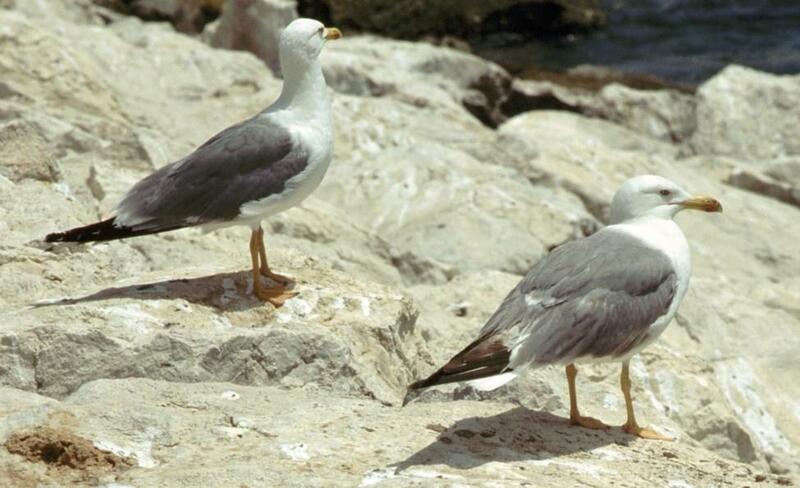 Long calls are predominantly of the shrill graellsii type (60%) with some deep argenteus (20%) and deep guttural graellsii (20%), the latter being assigned to adults looking in all respects like michahellis (see Mediterranean Yellow-legged Gulls in south west Spain ). Mew calls are very much (90%) like graellsii except for a small number (10%) like deep graellsii, assigned to individuals showing all the characteristics of michahellis. In August juveniles seem to invariably show white upper tails and as many as 50% show a white head, the rest being dusky. 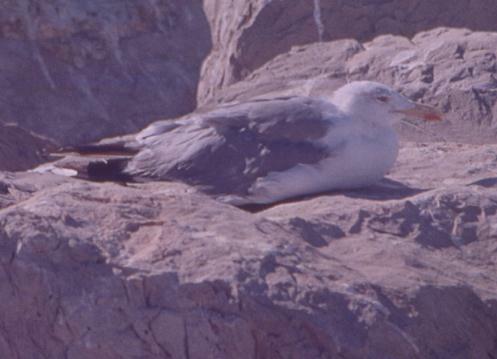 30-45% show heavy streaking on the breast and belly, similar to the position in Gibraltar. 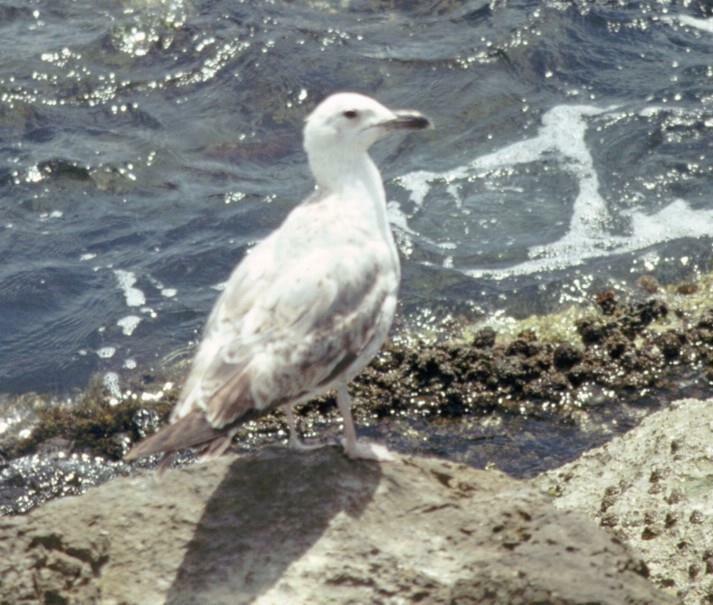 One juvenile showed tertials with a broad white fringe and large pale tip. In early June for six first-summers closely analysed, all showed some paleness to the bill base extending to 1/4 the length (2), 1/2 the length (3) and 3/4 the length (1). All showed very pale legs at this stage, looking almost white or straw coloured with fleshier feet. 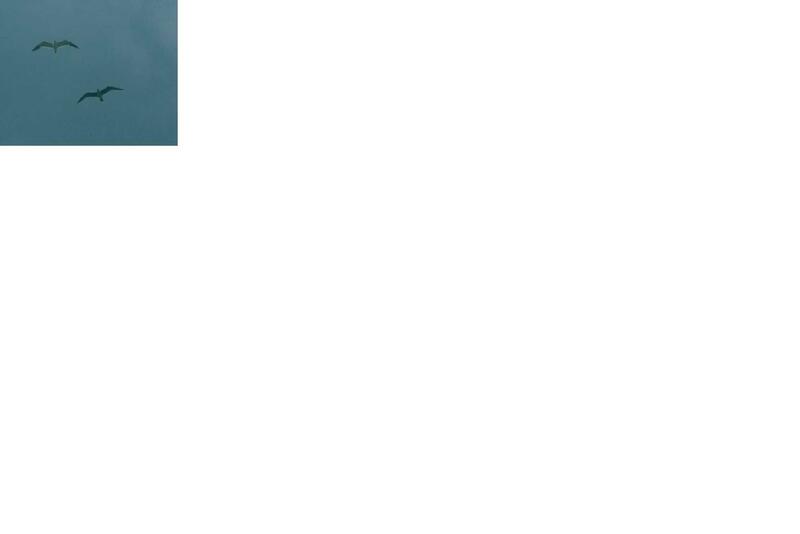 For moult one bird was at the P3/P4 stage and another at P5/P6. They were usually almost completely white on the breast and head with only one out of six showing dusky head markings, eye spot and breast. Four out of six showed faint markings on the belly. 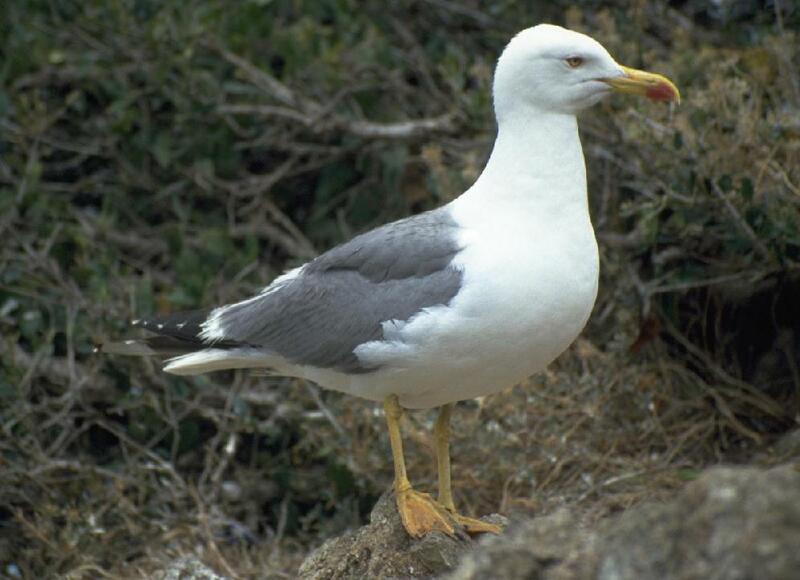 In early June second-summers were quite advanced with ochre legs, bright yellow bills, almost white underbody and head and blue-grey back and scapulars. 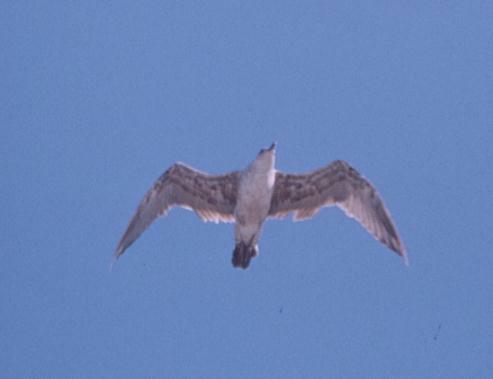 Coverts and outer tail still showed extensive dark markings. Adults at this time showed primary moult from P1 missing to P4 growing/P5 missing with the former state the most frequent. 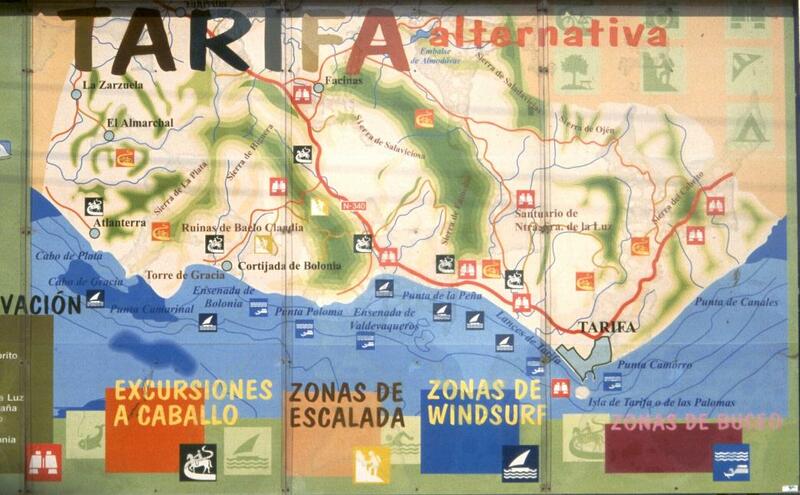 In early June two pairs were breeding on the stacks on the eastern side of the island off the southern end of Tarifa. A further c15 birds were over the north west corner of the island but this area could not be studied as it is under military control. 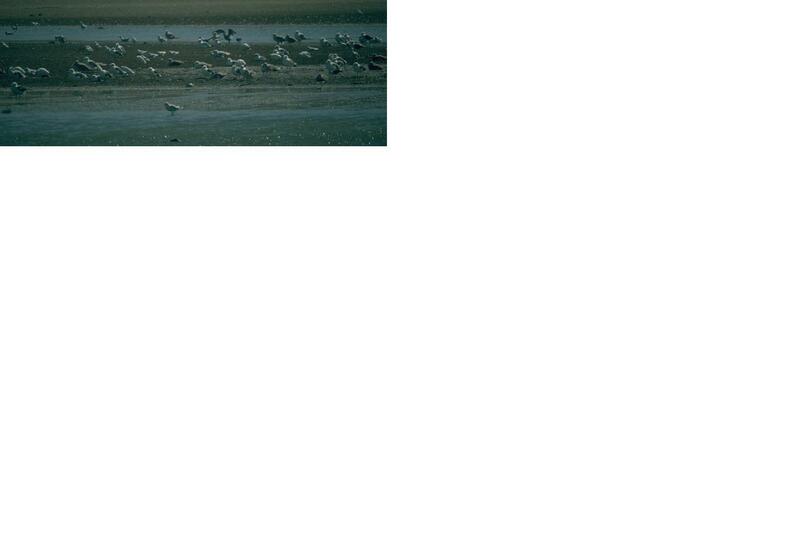 All these breeding birds were of the local intersection form. 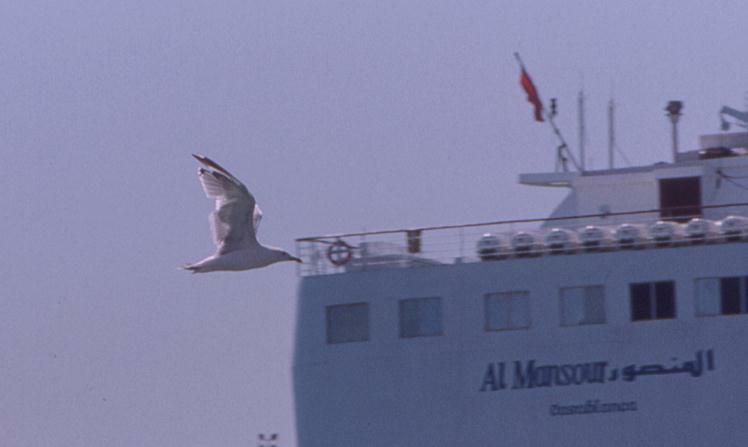 Photographs taken 17 August 2001 and 1 June 2002 by Nick Rossiter. Adult (back) shows long primary projection, third-summer (front) shows faded brown areas on primaries; both with small primary tips. Both also have short legs. Short legs. Well-spaced primary tips with P10 outside P9, even spacing from P10 to P6. Same bird as above, large mirror P10, no mirror P9, large area black on P6, broad band P5, black wedge on outer web P4, not yet started primary moult. Extensive black on tip, almost solid triangle of black. Typical michahellis outer primaries with large white tip to P10 and large mirror across both webs of P9; P5 has only a thin band. P7 is growing, P8 missing. 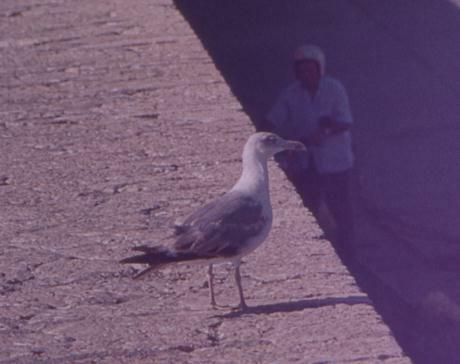 Leg length is inbetween that of atlantis and michahellis; distinct speckling on side of head, mantle lacks a strong blue component. Quite a heavy structure particularly on the head, bill and chest; P10 large white tip, P8 and P9 are missing. Second-winter with extensive grey invading coverts; white head except for dark spot around eye, bill with distinct pale area on underside of bill, dark straw legs, few flecks on side of breast, bunched wingtips P8-P10 with P10 under P9, legs intermediate to atlantis and michahellis, very solid and heavy build, classical boxy head. 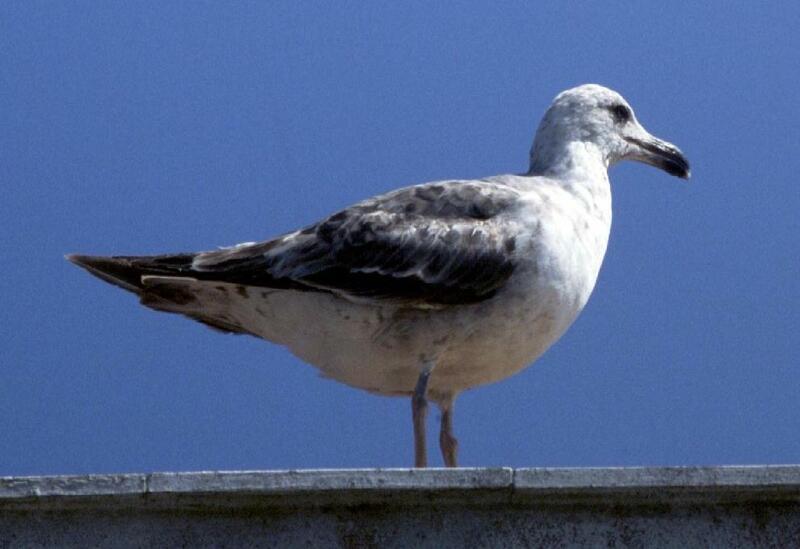 First-summer with extensive grey on back and scapulars, white head with largish dark eye spot, some speckling and streaking on breast, head is boxy. Juvenile with tertials with pale fringe and slight pale notching on middle of feathers, quite dusky head although forehead and nape paler, bill all black, head is rounded but front of head is extended. Adult with P9 missing, head white, bill stubby with medium orange-red gonydeal spot, plumage a darkish blue-grey, head fairly rounded. On closest adult, P5 is fully grown with broad black band, P6 is fully grown, P10 is covered by P9, P7 is growing and P8 missing. 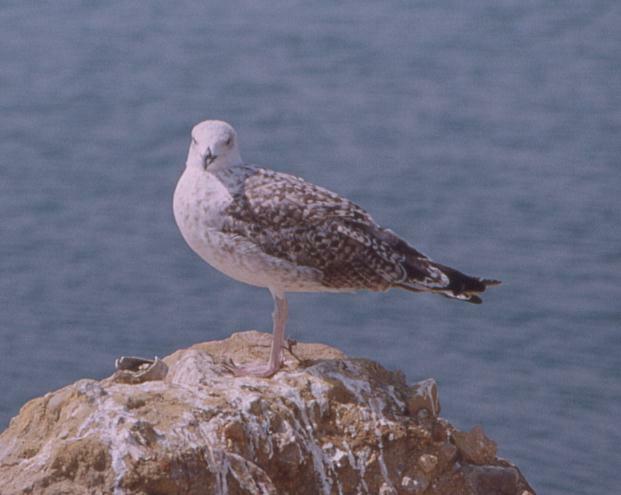 The legs are intermediate to atlantis and michahellis, head quite speckled on side and rounded with slightly elongated look, fairly dark blue-grey mantle, legs ochre-yellow, bill rather a pale yellow with largish orange-red gonydeal spot. 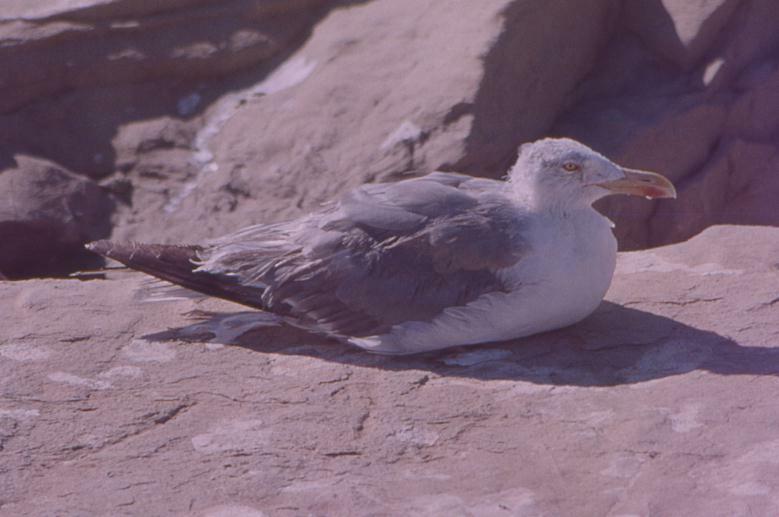 First-summer slouched in classical pose for michahellis, quite advanced with extensive grey on mantle but bill has only a small pale base, head and sides of breast quite dusky, bill very heavy. Adult at back (not showing head) with tips to P8-10 visible and bunched. P4 shows a spot, P5 a thin band, P6 is growing and P7 is missing. Another adult with very rounded head, slim build, P8-P10 present and bunched, P6 and P7 apparently missing, head quite white. Legs are about 0.8 height of body above -- intermediate to atlantis and michahellis. Juveniles: grey-brown, all black bill, tertials with uniform pale fringe (hint of slight notching on one feather), head quite dusky over crown and sides, breast heavily spotted, quite a heavy construction including head and bill, head domed and boxy. 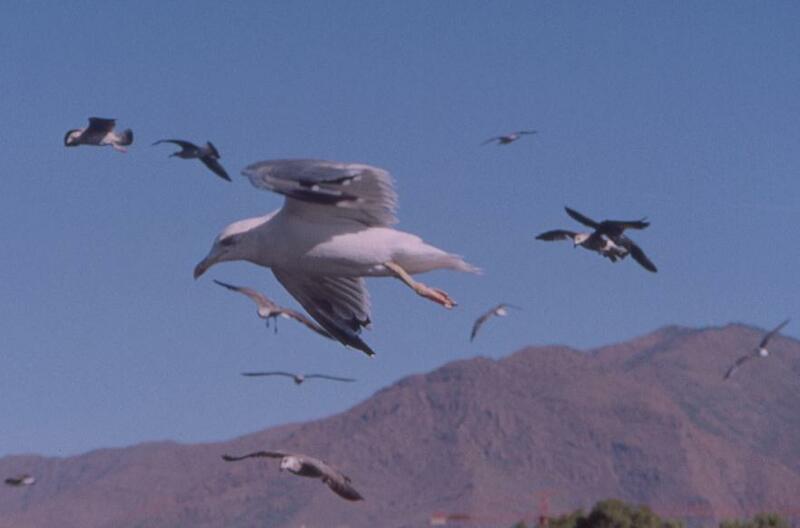 Adult in flight with mountain behind: P10 old large white tip, P9 no mirror, P8 missing, P7 growing, P6 large black mark, P5 broad band, P4 no black, P1-P3 new, legs yellow with pinkish tinge to feet, speckling around eye. Small primary tips on folded wing, tips are bunched with P10 over P9, P8 close inside, legs are short (c70% of body above) and bright yellow. Mantle lacks blue component; large orange-red gonydeal spot, pale iris, very white rounded head. Some mottling on secondary bar still, some speckles on sides of head, P10 old with large mirror, P9 old with no mirror, P8 missing, P7 growing, P4 new spot outer web, P5 broad band, P6 large black mark. Legs long, about equal to body height like michahellis, head quite dusky on sides, very obvious secondary bar, bill long with pronounced gonydeal angle, head not boxy but fairly heavy, mantle quite a dark blue-grey. Very strongly structured with fairly solid head, although not the classical box-shape, long heavy bill and prominent gonydeal angle. P10-P7 are present with small primary tips with P8-P10 bunched, P6 and P5 are apparently missing; bill is bright yellow with medium-sized orange-red gonydeal spot. 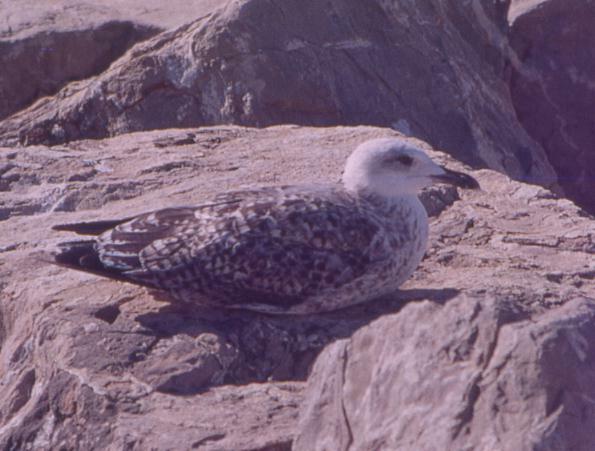 Other features are speckling on the side of the head, a leaden-grey mantle colour, heavy moult on coverts and remnants of darkish markings on outer coverts. Legs are long (c90% of body height), blue-grey mantle coming through strongly, extensive speckling on coverts, gleaming ochre legs, very pale iris. 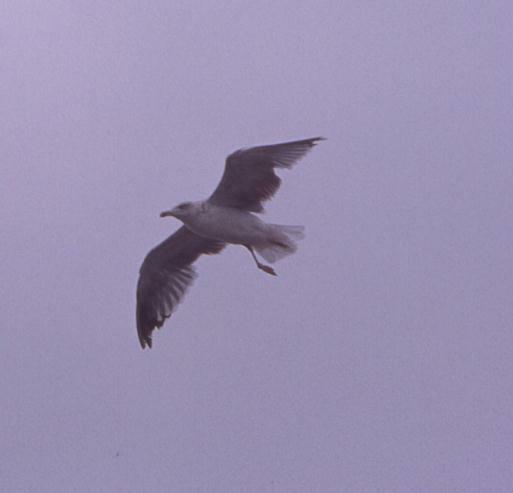 In flight this bird showed very white rump, all grey back and scapulars, prominent secondary bar, outer band beginning to break up on tail, primary moult P2 growing, P3 missing. Still in moult with P9 half-grown and P10 missing. Uniform wing and back looking a rather pale grey with mixed-in brown, tail is very pale with relatively narrow dark band. 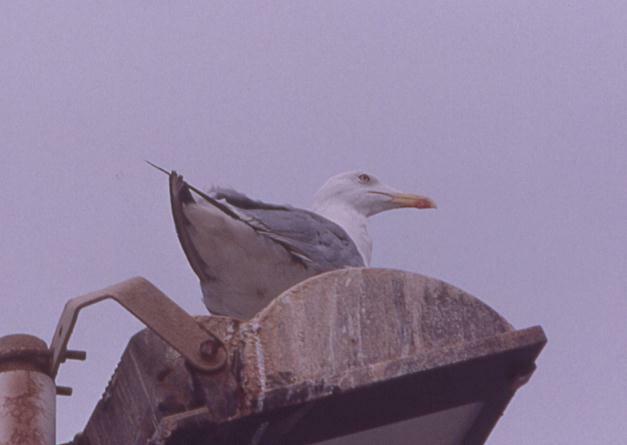 Pale base to bill, obvious grey on back, pale head with small dark eye spot, heavy mottling on side of breast, tertials with fairly broad pale edge and some pale notches, head quite heavy but not boxy, quite elongated, bill is heavy with a not very steep culmen. Appears to be still in moult with perhaps P9 and P10 still to grow fully. Rather faded on mantle, indistinct pale area emerging on basal half of bill, short legs with straw tinge. 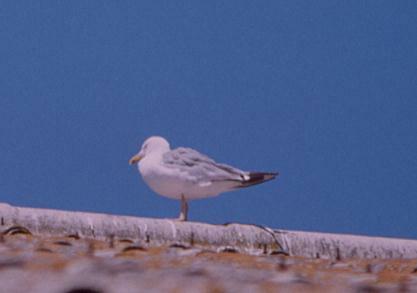 Almost white head and sides of breast in bright sunshine. Retarded individual but still with white head except for dark spot around eye. All black bill, extensive areas of brown (with ruddy tinge) on back and scapulars, loose feathering indicating active moult. 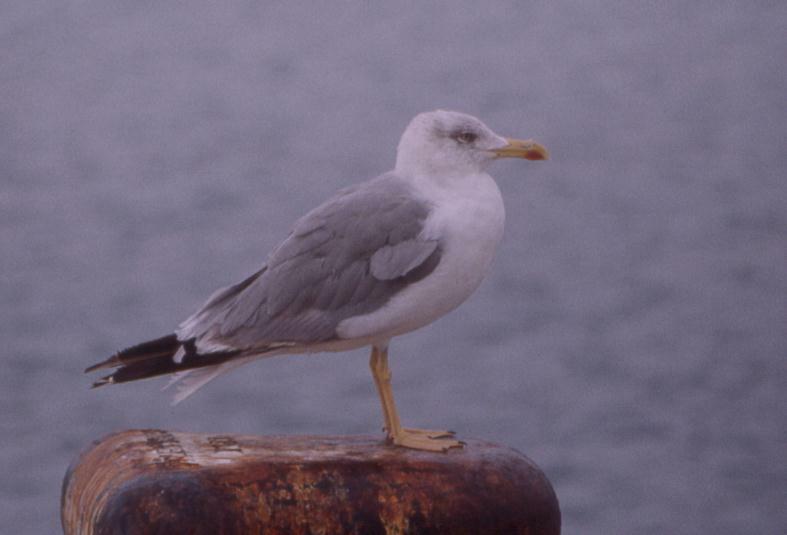 Tertials with extensive white on visible tip. 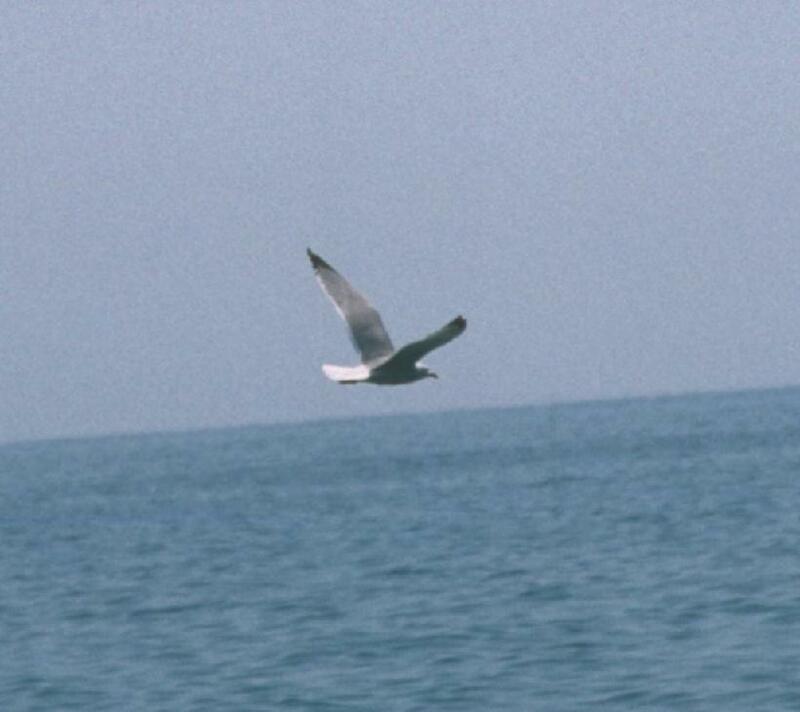 This bird showed pale flesh legs. Pale rump (slight mottling), thinnish tail band, one bar only on inner wing, grey-brown mantle, dusky head, no pale primary panel. Comments: structurally some birds here (30%) have the heavy features, including the boxy heads, of michahellis and they appear significantly larger than the birds in Tanger. 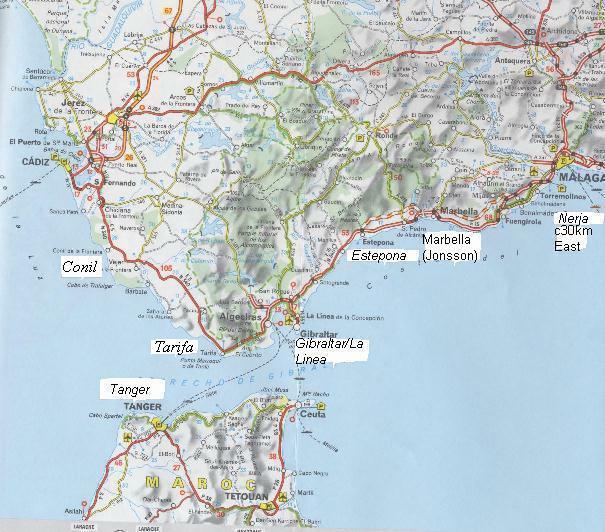 The legs are often longer at 75-90% of the height of the body above compared to 70% in Tanger and almost 100% in michahellis. An analysis over the two visits showed for 16 birds of all ages that ten had legs from 75-90% of the body above and six from 60-70%. At rest the heavier heads were not tucked into the neck but were held with the bill pointing downwards as in michahellis. 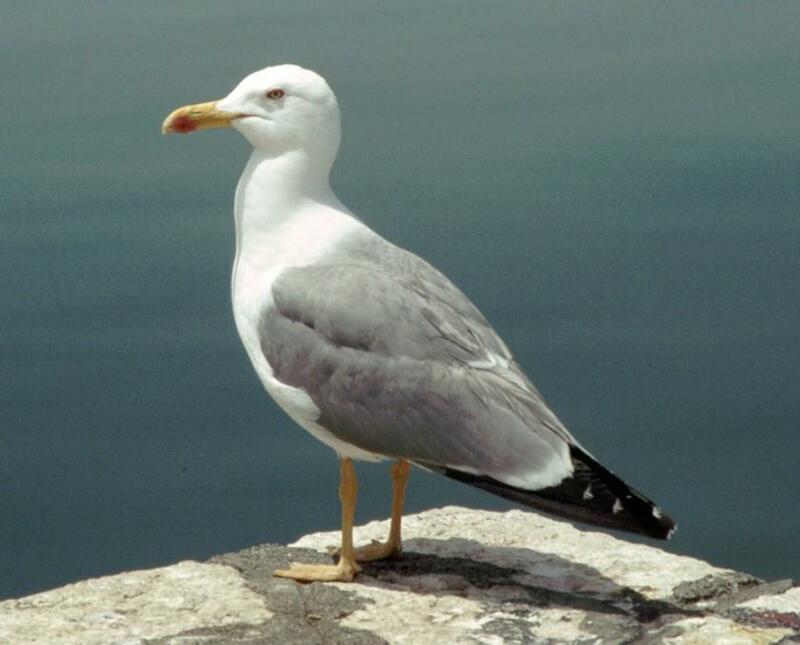 In mantle colour most are a similar blue-grey to that in the Tanger/Gibraltar area but a minority (one in eight in one group) are a more leaden grey. Calls show considerable variation perhaps reflecting the genetic mixing. 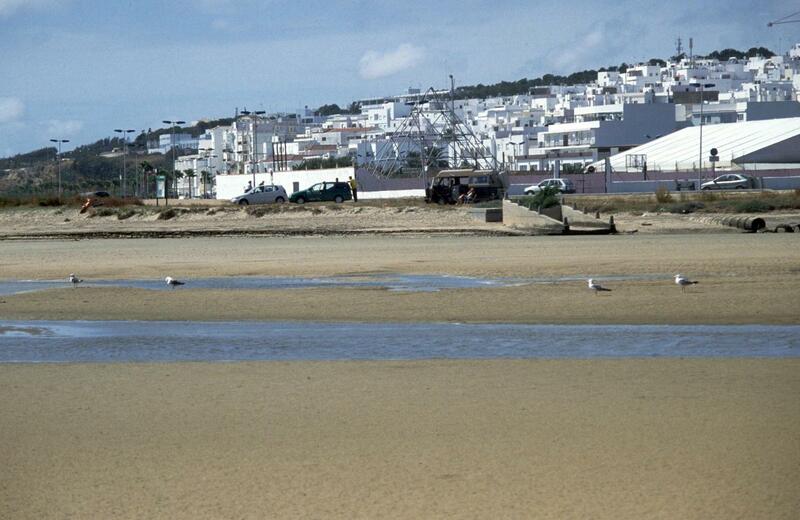 The commonest long calls (40%) are of the shrill graellsii type as in Tanger and 30% are close to graellsii itself.  20% are guttural, as in michahellis, and 10% are a deep argenteus. Mew calls are often like graellsii (70%) with the remainder equally like michahellis or argenteus. 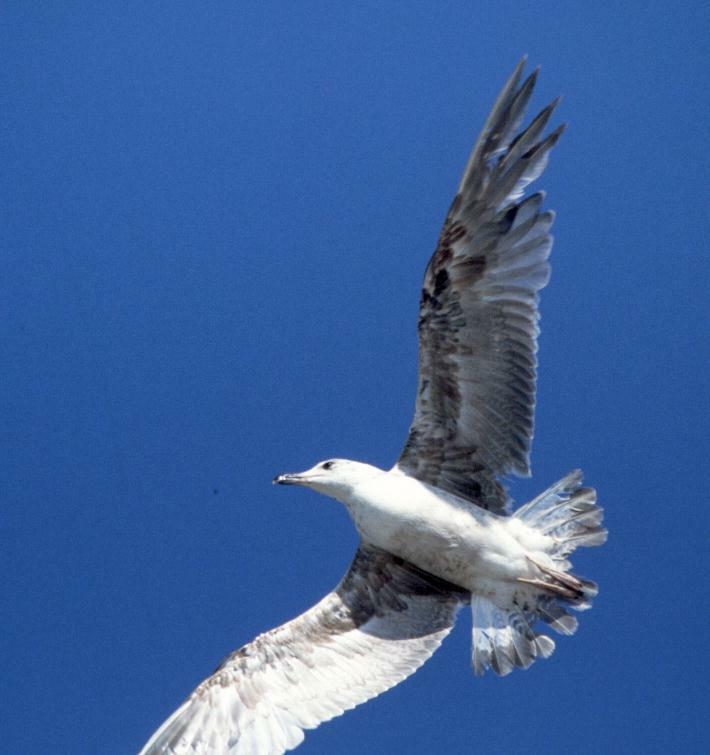 In June primary moult had just started in adults with P1/P2 being the most frequent state. 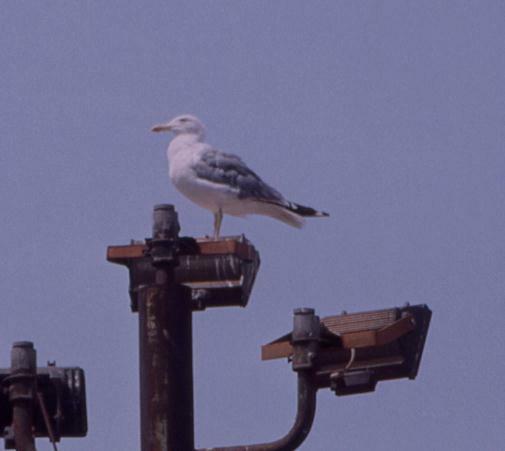 The bare parts were much brighter in June than in August on second-summers, third-summers and adults with bright yellow bills with large red gonydeal spot and bright dark yellow legs. 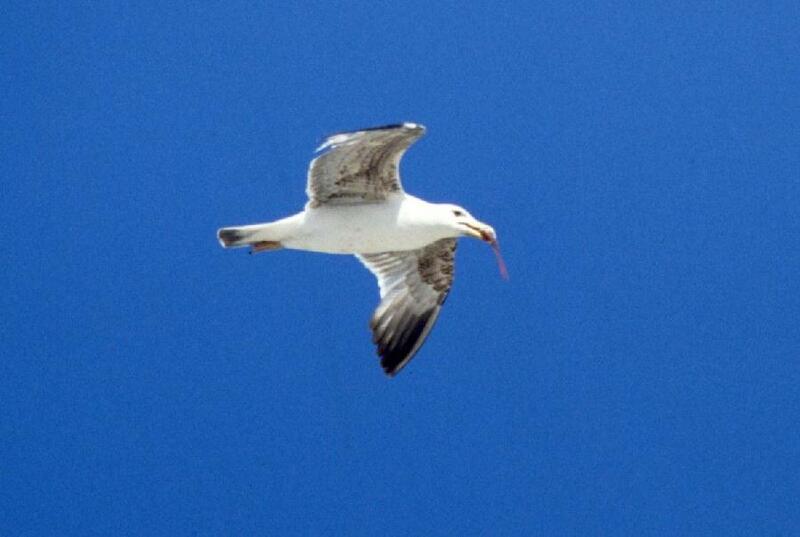 As further east in Nerja, adults show more black on P5 than at Tanger with 80% having a broad band on this feather. As many as 63% show a spot on P4. As at Tanger P9 has slightly more white than in the dark form with 33% showing a mirror on this feather. The effect of wear on P10 is illustrated by one out of eight showing a complete white tip in June and six out of ten in August just before this feather is moulted. 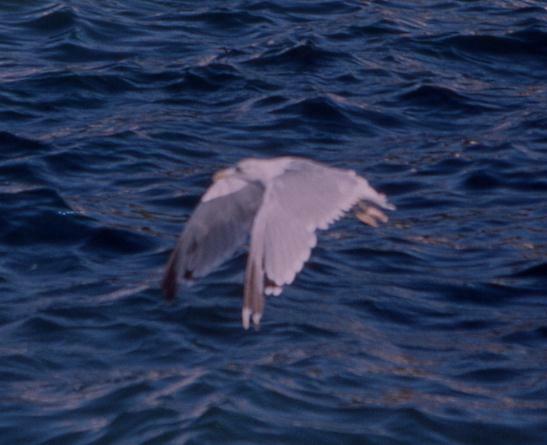 On a sample of four juveniles, three had tertials like those in the Canaries with a narrow pale fringe; one was different to any found in the Atlantic showing, in addition to the narrow fringe, two slight notches on each feather edge. Two out of five showed a pale base to the bill by mid-August. Considerable variation was found in maturity of first-summers in June with a few quite advanced with faded whitish fairly clean mantles, pale yellowish-tinge to legs, pale area emerging on bill base and much white on the tertial tips. Others had straw-coloured legs and greyish mantles but they retained residual brown blotches on the mantle and almost all-black bills. One bird was much more retarded with brown mantle, all black bill and pale flesh legs. 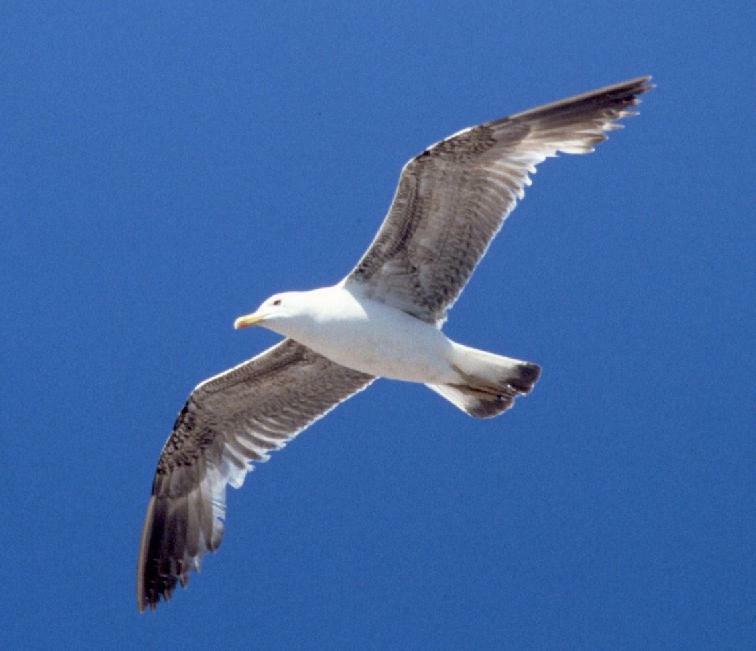 On a small sample P5/P6 was the most frequent state of primary moult in June in first-summers. 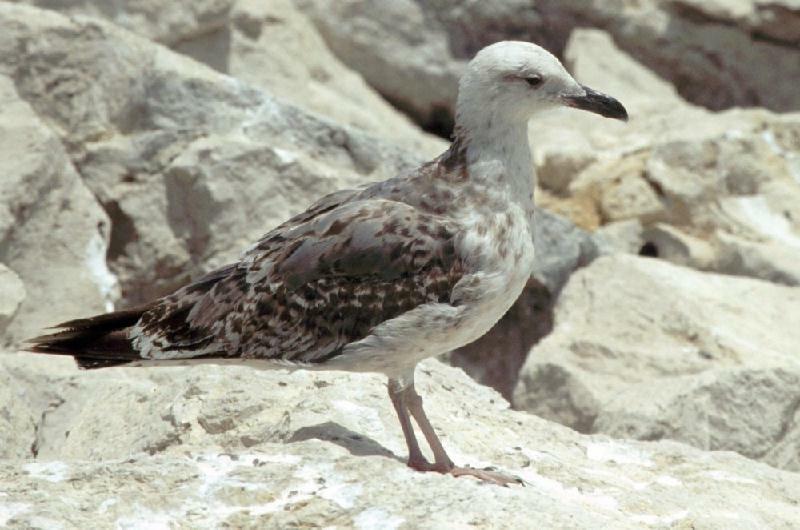 In August 2002, as in Tanger, equal numbers of first-summers/second-winters had completed primary moult or were in the final stages of the moult with P9 growing and P10 missing. Photographs taken May 1996 by Nick Rossiter. 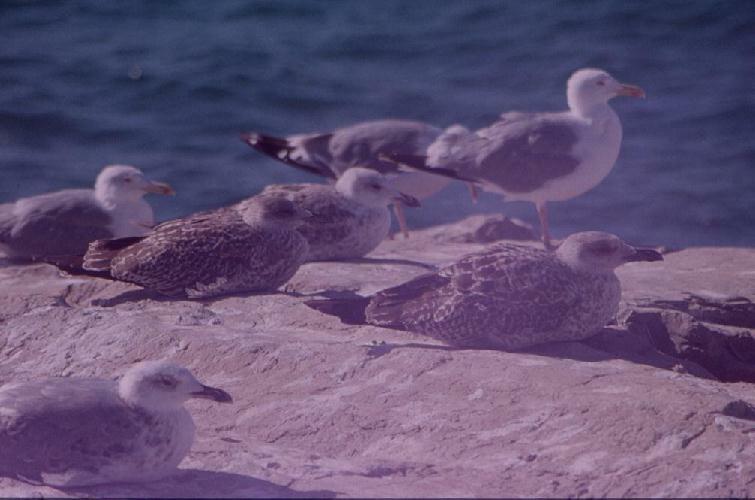 From left: on shoreline adult, first-summer, second-summer, second-summer, adult Yellow-legged Gull; on beach first-summer Audouin's Gull. 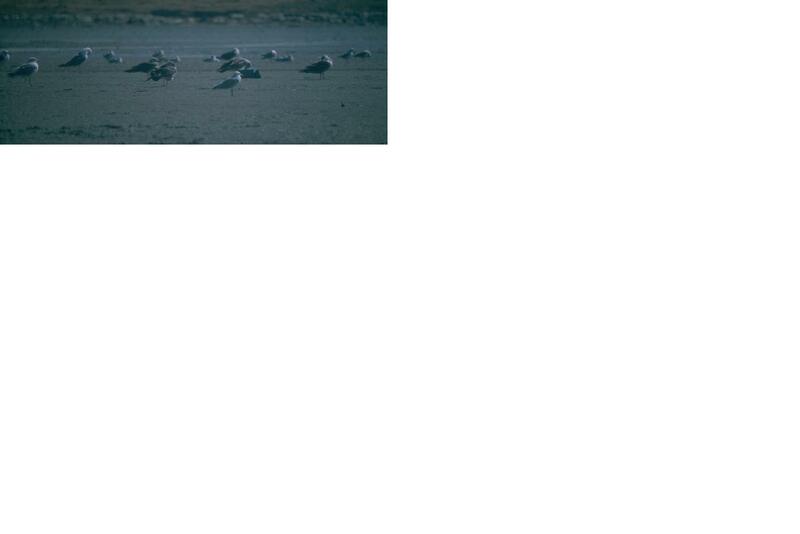 Comments: the mantle shade of these birds appears to be similar to michahellis although the colour is more blue-grey. The primary pattern is, however, more like atlantis with a large black triangle across the outer primaries and reduced incidence of white mirrors on P9. 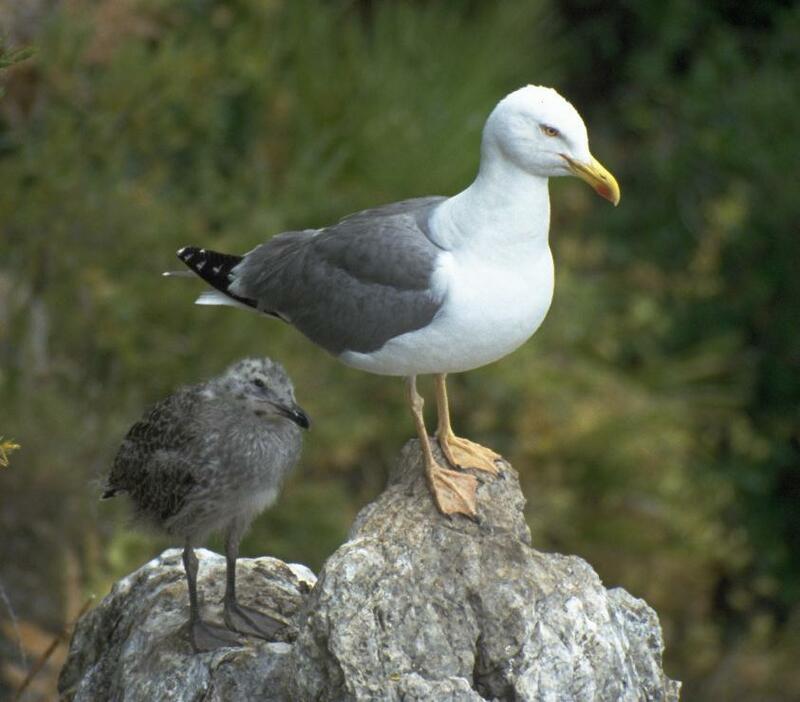 The most striking feature is the great variability in size with some 'brutes', similar to the largest Mediterranean Yellow-legged Gull, and some (around 25%) quite small, similar to the smaller atlantis (that is close to graellsii). 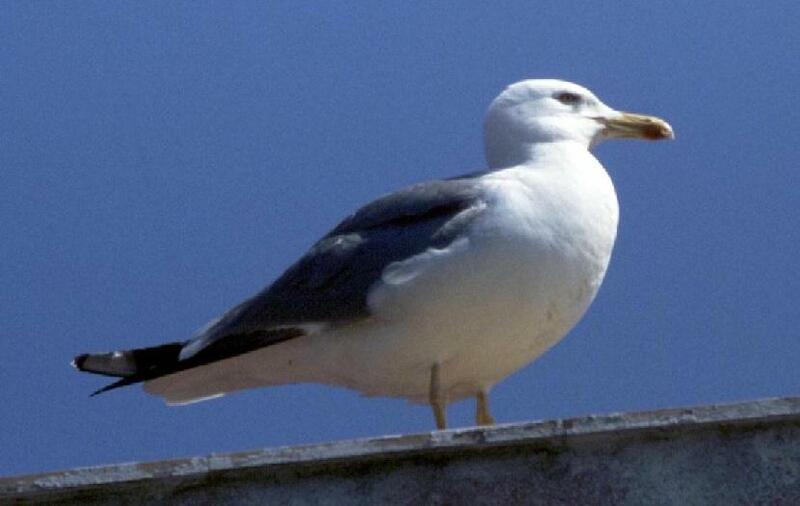 Rather similar to those in south Morocco with bulky chest, strong stubby bill and rounded head. 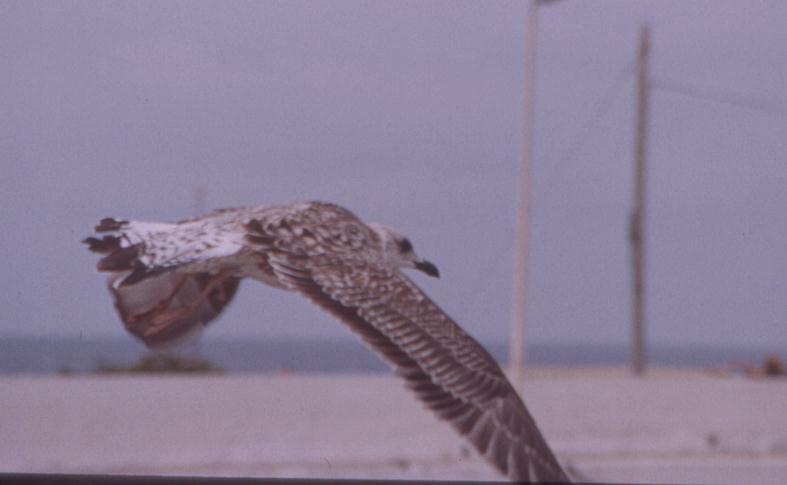 Very loose plumage indicating moult. Head is quite pale, legs are a deep ochre. 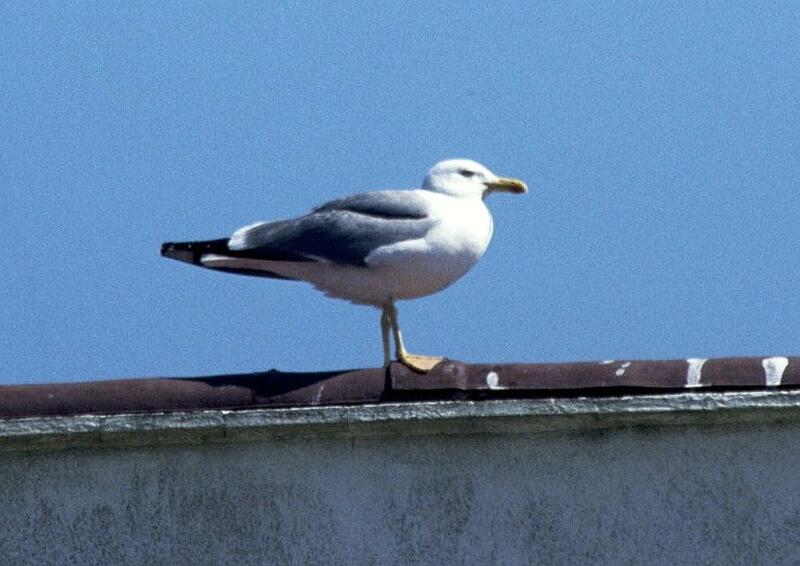 Such birds smaller, less heavy heads and necks, slightly darker, more of a blue-grey in the mantle and with more rounded heads, less stout bills and shorter legs than michahellis on same roof. 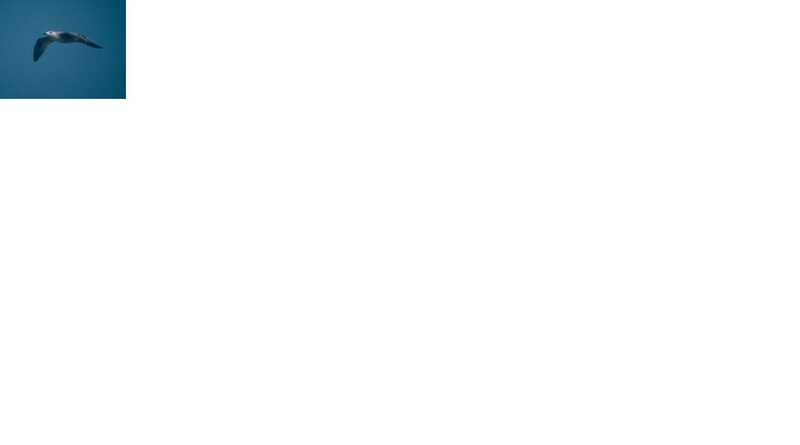 The two forms are bimodal when mixed. 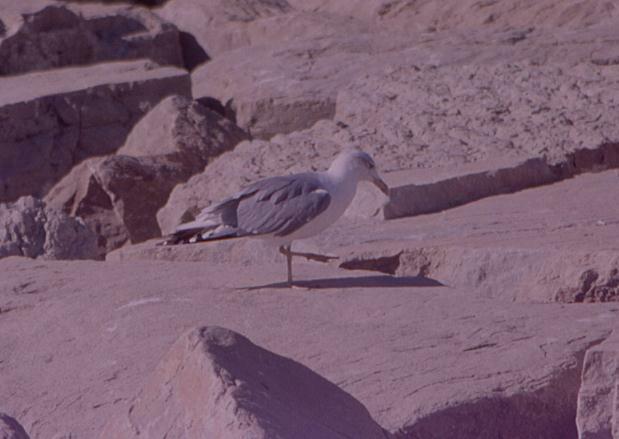 Short legs are typical for atlantis, mantle is a relatively pale blue-grey. Bill has steep angle at culmen, head is rounded. White tip to P10, mirror P9, P5 thin black band, P6 larger black mark, P7 growing and P8 shed, also moulting secondaries, head is quite pale. 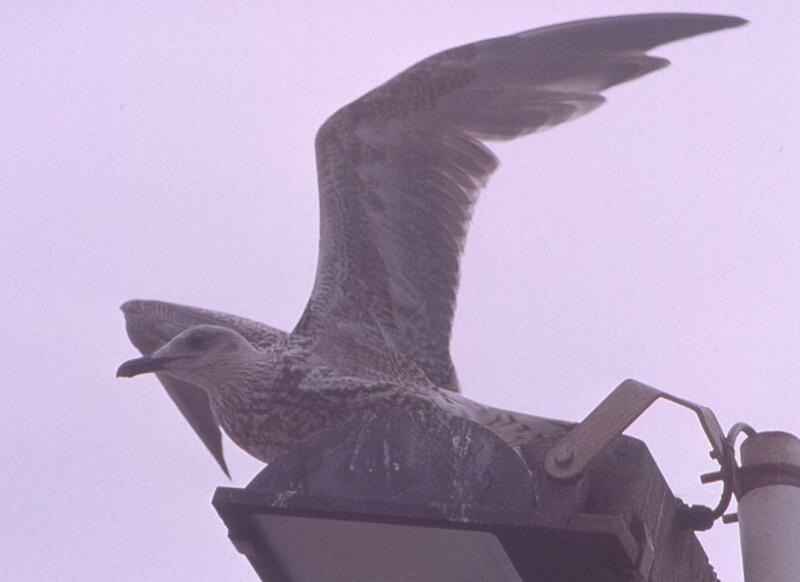 Slight dusky markings on underwing, tip to P10, no mirror P9, thin band P5, growing P7, missing P8, fairly clean head. Obvious secondary bar and fainter carpal bar, still obvious but reduced tail band, old outer primaries, P1-P4 new, P5 growing with broad black band, head and neck slightly speckled. Reddish tinge, underwing coverts faded, P1-P8 new, P9 shed, old P10, under-body fairly dusky and obvious dark eye patch, legs flesh. Streaking on sides of breast, head fairly clean, bill all black, indistinct pale primary panel, some contrast between underwing coverts and rest of underwing. Reddish tinge, obvious secondary bar, faint greater coverts bar, indistinct pale primary panel, quite dusky on head and breast, white rump. Fairly dusky on under-body and lower part of head (crown 'burnt-out'), indistinct pale primary panel, moderate contrast between underwing coverts and rest of underwing. 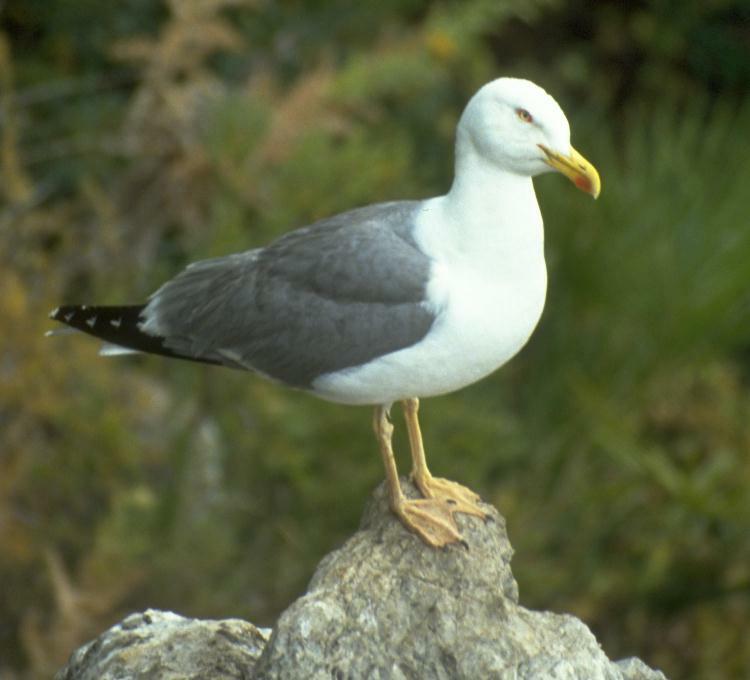 The adult Lesser Black-backed Gull has a darker trailing edge than Yellow-legged Gull and also has only just commenced primary moult. 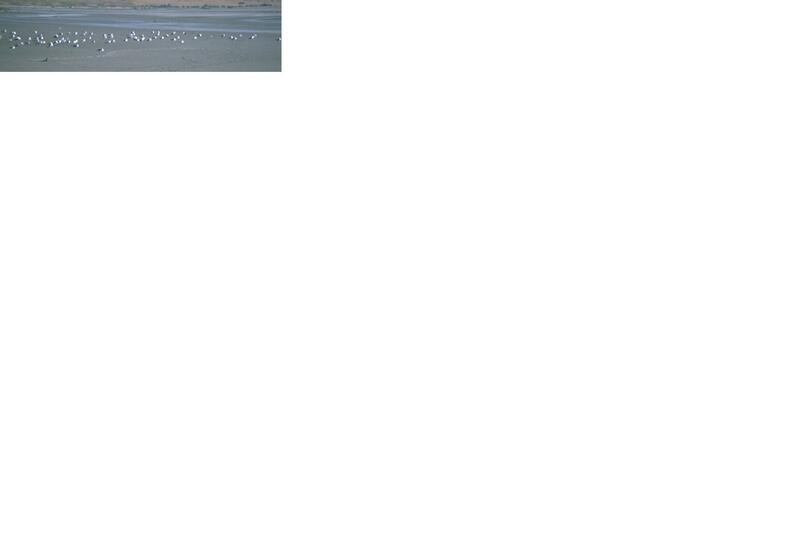 The Audouin's Gull is just right of centre. 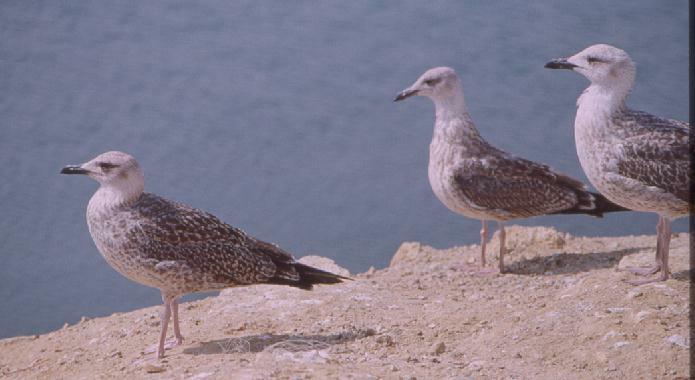 On the left is an adult Yellow-legged Gull (extreme left) and an adult graellsii (next from left). 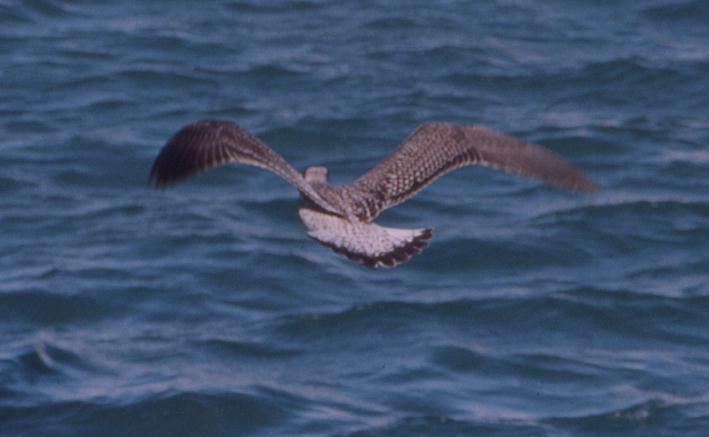 Juveniles usually have fairly dusky heads (80%) in the intersection zone. This one appears paler but the strong light needs to be taken into account. The primary panel is indistinct. 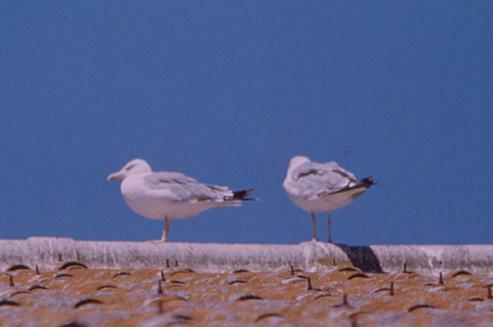 In the two immediately above, the size difference between graellsii and Yellow-legged Gulls is not obvious. 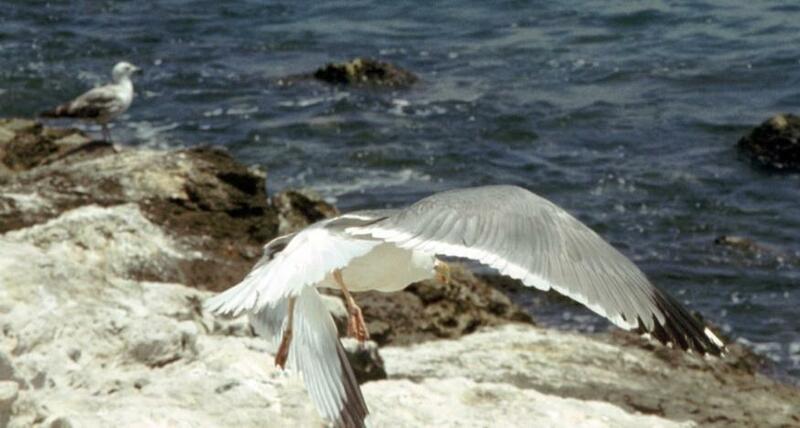 The sturdier nature of the Yellow-Legged Gulls though is apparent. Comments: (adults) the population appears to be bimodal as regards characteristics. In terms of size, most are similar to graellsii but a minority (7% in 2001, 10% in 1993-94) are much bigger. 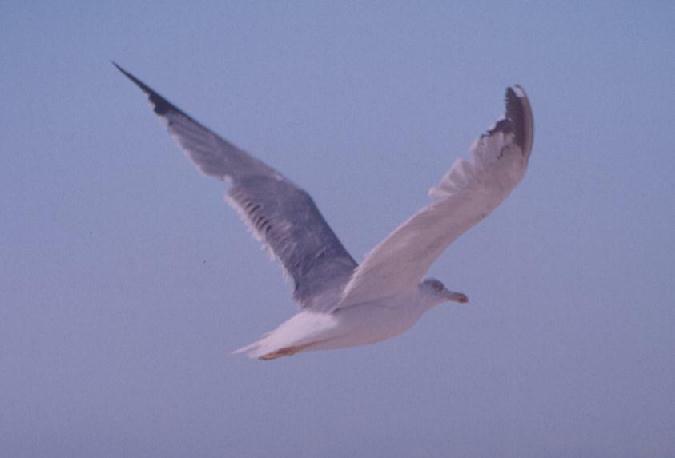 The larger birds appear sturdy alongside the smaller birds with heavier heads and necks, longer legs and stouter bills. 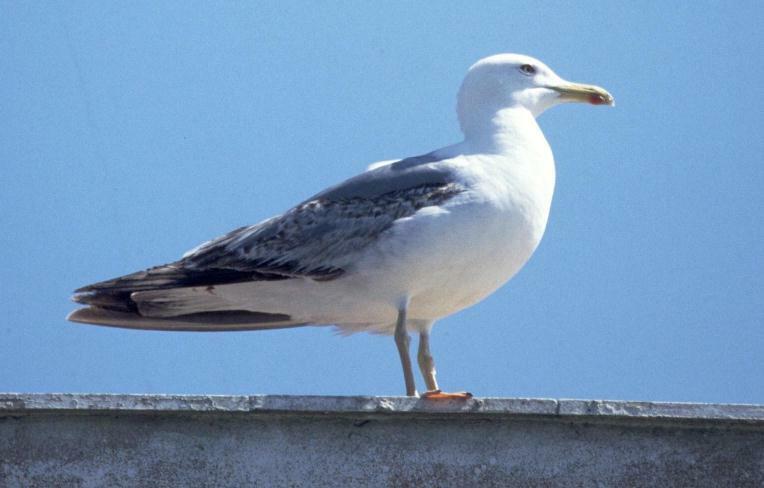 Their heads are flat crowned with angular sides, hence less rounded. The larger birds also hold their bills pointing down at rest in hot weather whereas the smaller birds tuck their heads into their necks or hold them horizontally out in compact fashion. Structurally and in mantle colour and calls, the smaller birds are similar to atlantis except that their mantle shade is slightly paler, their heads are quite white in August and there is more likelihood of a mirror on P9, a slight indent on the black triangle on the outer primaries and a definite band on P5. 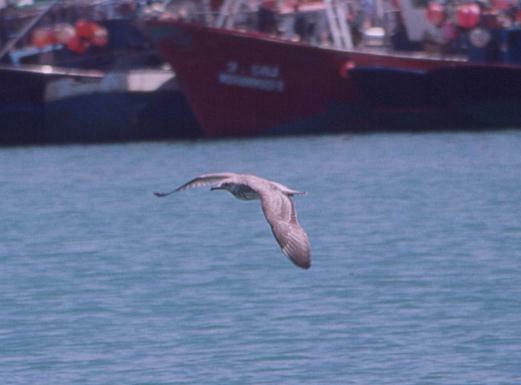 The larger birds are similar to michahellis. Juveniles are similar to those in the Canaries in many respects showing in general dusky heads, grey-brown mantles (some with rusty tinge), gleaming white rumps and indistinct pale primary panels. The tertials, however, show a broad white tip only to the rusty-brown centre as in michahellis. 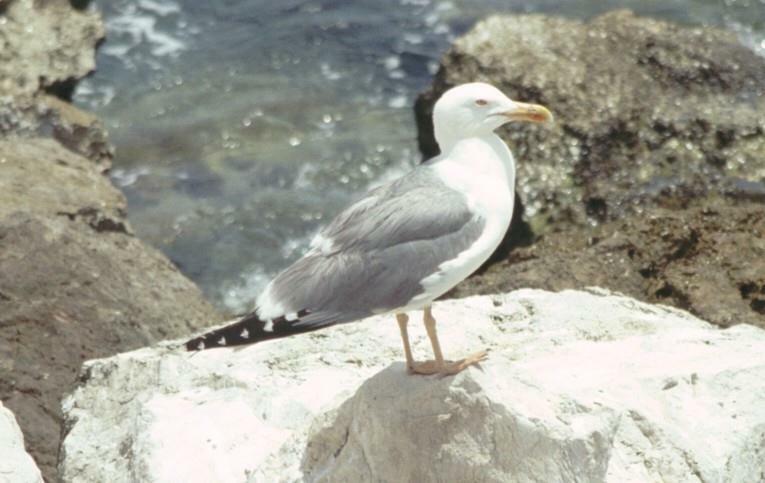 Notes for 28 August 1994: interesting 'YLG' adult, rusty-tinged head markings, too substantial and heavy a chest and bill for Lesser Black-backed Gull, no primary tips visible at rest, pale yellow legs, bright yellow bill, medium-sized bright red gonydeal spot, red orbital ring, flat head. In flight: in full moult, some duskiness on trailing edge but not as much as in graellsii, dark mantle and wings approaching graellsii, white on both outer primaries. Size is similar to graellsii. Photos: the small head, stubby-tipped bill and bold chest are obvious structural features; the body is not particularly attenuated; the bill is slightly drooping; the legs are not particularly short. The mantle is a dark blue-grey subtly different from graellsii. Moult appears to be up to P5 missing and therefore rather late; the head shows rusty speckling through eye and around nape. Black on wing-tip appears to form a solid triangle up to the outer web of P6. There is a white tip to P10 and a mirror on P9. This bird was initially unassigned. 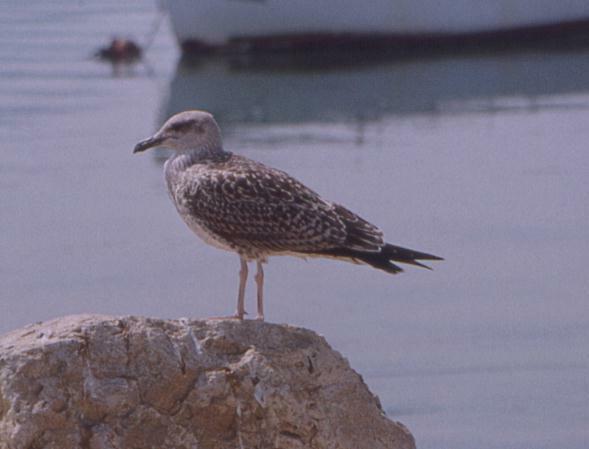 In correspondence with Andy Paterson (author of Las Aves Marinas de España y Portugal, Lynx Edicions, Barcelona 1997) in July 2001, he suggested that it might be a hybrid Iberian Atlantic Yellow-legged Gull x Lesser Black-backed Gull. This assignment seems to be the best one available as the bird has many features of these two forms. 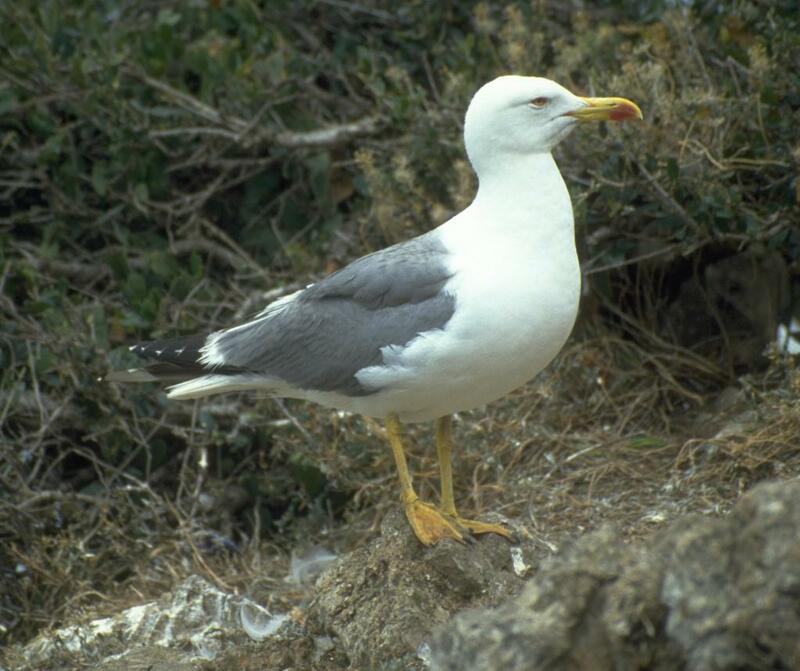 In his book (p.291), Andy reveals that significant hybridisation of this type takes place from Berlengas Islands (south Portugal) through to the Basque Country with as many as 23 mixed pairs at one site in Galicia in 1992. 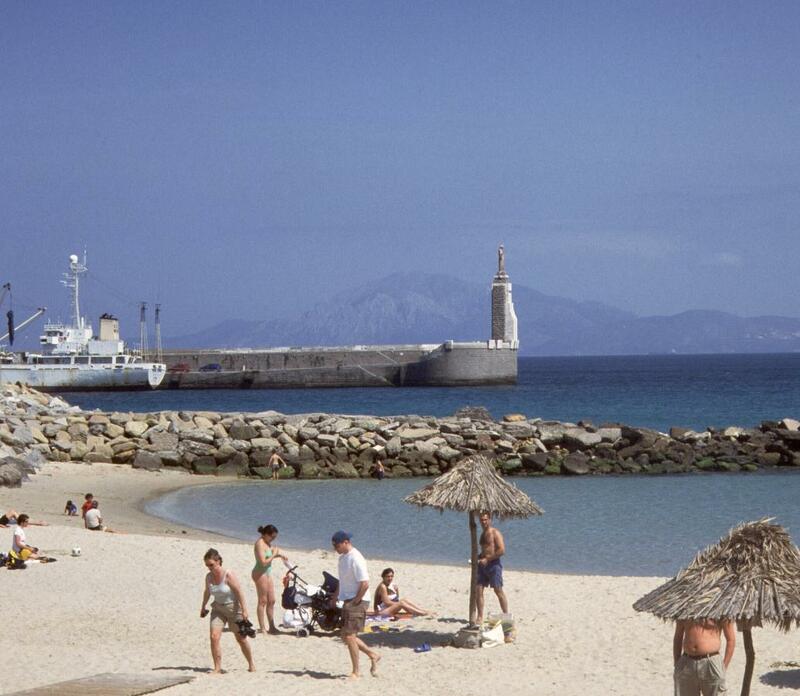 This photograph shows the narrowness of the straits of Gibraltar. totals for main patterns: P8/P9 5; P7/P8 11 (40%); P6/P7 7; P5/P6 2 (+ 3 others). 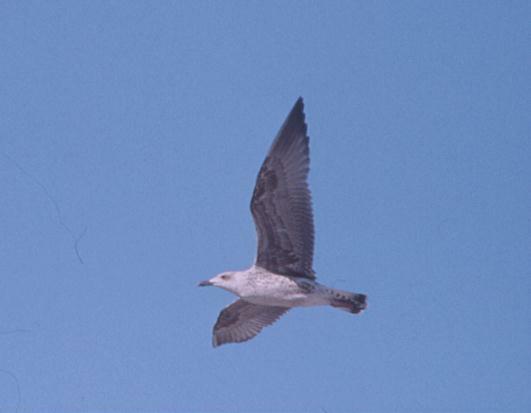 In Conil, primary moult in mid-August for adult michahellis ranged from P5/P6 to P7/P8 with the latter the most frequent state (46%). P7/P8 3; P6/P7 6 (55%) (+ 2 others). 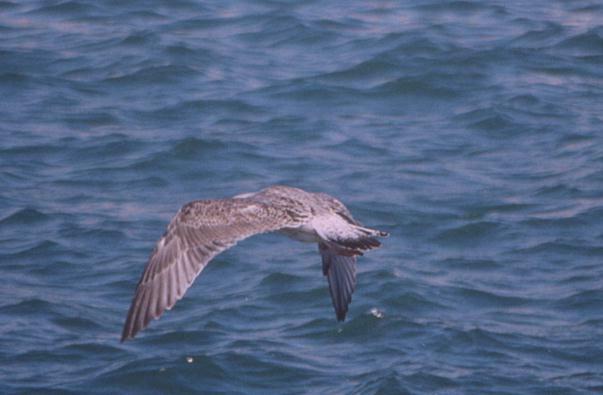 The rate of moult of the three populations forms appears to be very similar. © Copyright Nick Rossiter / Tom Cadwallender 2000-2002.